HOW DO YOU STRETCH YOUR EAR? Back when I was 18, I decided to start stretching my left ear (I wasn't much into symmetry at the time). One of the things I get asked quite often is How did you do that? The good news is it doesn't involve any hole punches! Since my posts on my forward helix piercing and rook piercing were so popular, I thought it might be helpful to write one about stretching my ear. There are a few different ways to stretch but the most common, and the way I used, is tapering so that's what this post will focus on. First of all, obviously, you need your ears pierced. Just standard ear piercings are required to start with. In order to start the stretching process, you need to insert tapers. It is best if these are made of steel, although mine were acrylic. 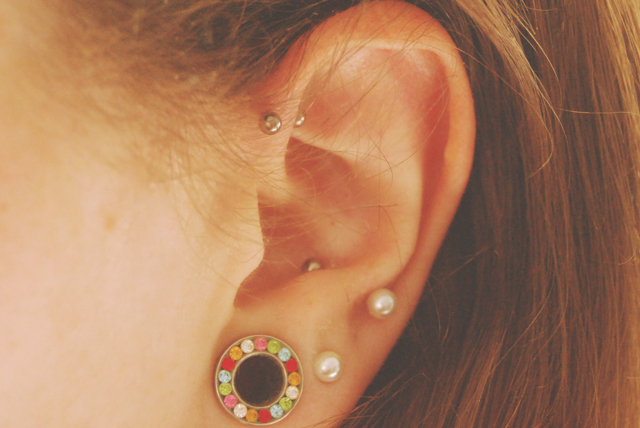 Most ear piercings are 1mm in diameter so it's best to start with a 1.2mm taper. After a hot bath or shower, massage your ear with your fingers and apply a water-based lubricant to the taper and ear. Then slowly but firmly push the taper in. The aim is to get the taper right through to the end. It will feel hot and uncomfortable but should never be very painful. Once through, insert a plug or tunnel in the corresponding size. Tapers should not be worn as jewellery as they can easily be knocked or caught and that can cause all sorts of issues! To stretch your ears further, repeat the process until you reach your desired size. However this is a slow process and you must allow your ear to heal before going up a size. About 3 months is a good guide to be on the safe side and only go up one size at a time. The general sequence is: 1mm, 1.2mm, 1.6mm, 2mm, 3mm, 4mm, 6mm, 8mm... and then up in multiples of 2 from there. There's a rumour that there's a "point of no return" where you can no longer shrink down to normal size. Although this is true for many, there's no universal size. It's different for everyone so don't rely on being able to shrink down again. I usually buy mine from eBay or Amazon as there is a huge range. They also have some great kits like these for newcomers to stretching with everything you need. These sites are also really good when it comes to plugs or tunnels. My rainbow tunnels are here, although mine are 8mm. You can also buy them in piercing and tattoo studios but I find they tend to be quite limited in terms of sizes and designs. When you're new to wearing plugs or tunnels, it can be difficult to know what to look for. Plugs are solid jewellery like this , whereas tunnels are... well, like tunnels. The ones with holes in the middle like this . Steel is my favourite material as it's so easy to sterilise. Acrylic and wood are both porous materials, so they harbour more bacteria. Silicone is easy to fit into the ears but not the best for freshly-stretched ears so stay away until they're healed. Then there's all the shape terms. The easiest to find is double flared, or saddle. I never wear these because I find them so difficult to remove and was once convinced I'd need to get a plug cut out. Most of my jewellery is screw-top which, as the name suggests, has a side that screws on to keep it in place. Single flared and top hat jewellery is also good for me, but these are held in place with a small rubber O-ring and I lose them all the time. Finally, there's non-flared which is just a straight piece of jewellery secured by an O-ring at each side so definitely not suitable for me! Sounds complicated but this image sums it up nicely. If there's anything else you want to know, or if you want me to clear anything up, just let me know in the comments and I'll get back to you asap. I think these small stretches are so cute! Would you ever go eeeeeven bigger? When I win the lottery and don't have a professional image to uphold, I'll go to 10mm and possibly 12mm. No bigger than that though. My husband had his ears scalpled at a tattoo convention, from nothing 6mm. Then he stretched the way you explain to get to 16mm. I tried stretching but i am a huge wuss and even with a tank load of wine couldn't do the first taper! Lol. I used to stretch my ears, like you I stretched one ear (my right one) first. A couple of years later I stretched the other one, though that one never ended up as big as the other one. My right one was about 8mm at the most, and it's never actually shrunk back to the original size. Aw yours is so cute I love how bright the plug is!